Drain and rinse noodles; pat dry. Microwave for 1 minute, then pat dry again (the more water you soak up, the better the end result). Set noodles aside. Prepare chicken or Gardenburger patty stovetop with nonstick spray and set aside. In skillet, heat Boca Ground Burger for approximately 3 minutes. Cut chicken into bite-sized pieces. 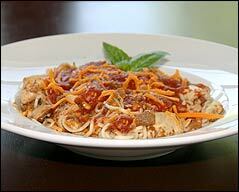 Combine chicken, Boca meat, noodles, sauce and cheese, and mix well. Microwave entire dish for one additional minute. Enjoy your feast! Preheat oven to 425 degrees. Drain, rinse, dry and cut noodles. 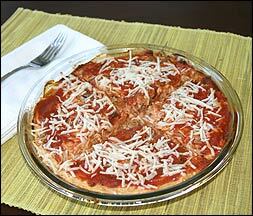 In a round oven-safe baking dish combine noodles, veggies, Egg Beaters and 3/4 cup of tomato sauce. Bake for approximately 25 minutes, or until firm. Remove from oven and spread remaining 1/4 cup of tomato sauce atop pie. Next, sprinkle cheese on top. Return to oven until cheese has melted. Allow to cool (if you can!) and enjoy. Preheat oven to 425 degrees. Drain, rinse, pat dry and cut Shirataki noodles. 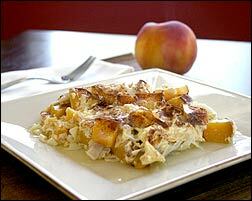 In an oven-safe baking dish combine noodles, egg whites, Splenda, peach, cottage cheese and cinnamon; mix well. Bake in oven for approximately 25 minutes, or until firm. Enjoy this peach-tastic, cinnamon-y goodness! ** HG Tip! For all Shirataki recipes, be sure to drain and rinse noodles well, and pat very dry. Also, prep noodles by cutting them up a bit to control their unwieldiness. Today, August 24th, is National Peach Pie Day. Check out our fantastic Peach Crumble recipe! HG Heads Up! Re: yesterday's "Ask" about caffeine. Please note that even decaf coffees still contain small (and in some cases not so small) amounts of the stuff, and if your doctor says you can't have ANY caffeine, you should avoid these as well.